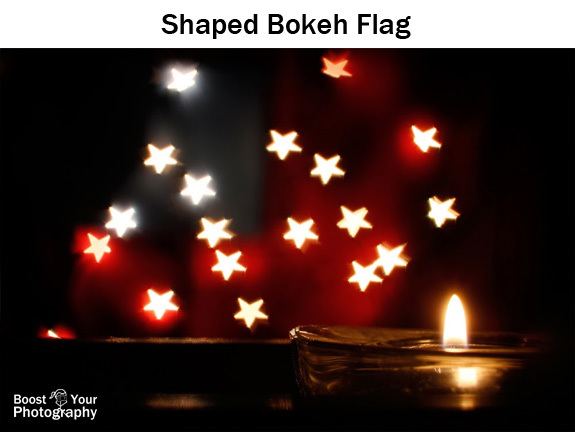 The first article in this series introduced you to All about Bokeh, and this second one will cover the topic of shaped bokeh. Shaped bokeh takes the concept of bokeh one step further by transforming those out-of-focus circles of light into another shape, with endless possibilities. Seriously, that is really it. An x-acto knife is helpful for making the really small cuts, but I did my first few with a regular pair of scissors. You could also use a shaped hole puncher, if you wish. The steps, you can basically intuit from looking at the picture above. Cut out a length of black cardstock, roll it around your lens to make a tube, and tape it together. Trace around the circumference of your lens/tube. Cut out that circle, adding about a half inch or so all the way around. Then, cut a series of notches into the circle (back to the original, traced circle). Fold the notches back. You can then place the circle over your lens and the tube and secure it in place with a rubber band around the tube and the folded down notches. 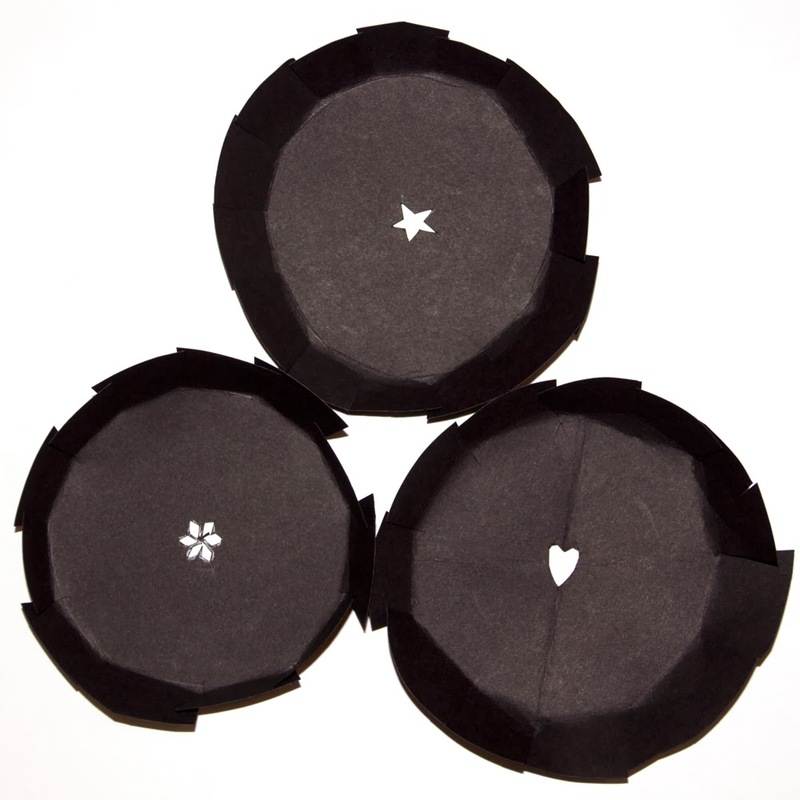 Now that you are well-armed with your shaped bokeh-making tube and filter(s), you are ready to start shooting. 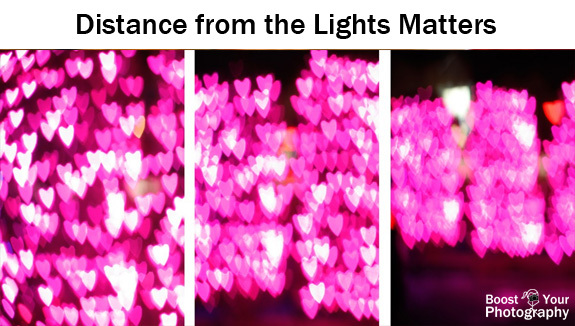 Many of the principles are the same as when shooting any kind of bokeh. You will need to shoot with your lens wide open (the widest aperture available, like f/1.8). You will want to have your subject fairly close to the camera and the background at least twice as far away. 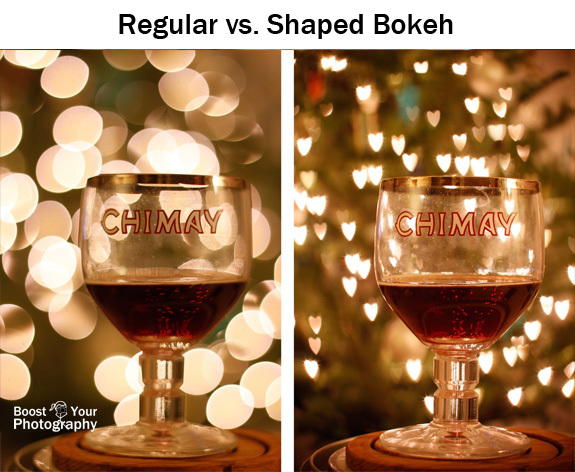 You will need a background that will render large, circular bokeh, which is why the holiday season is an ideal time for shaped bokeh. Hang up some strands of lights or go stand in front of your neighbor's tree or house, if you prefer. 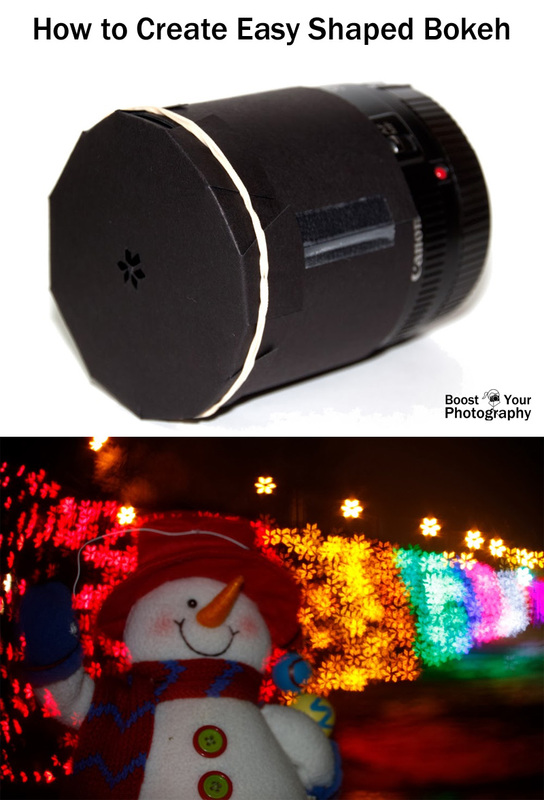 The easiest way to shoot shaped bokeh is to compose your shot before putting the shape in front of your lens. A tripod is particularly helpful so that you can focus on your subject first and then switch your lens into manual focus, which will lock the focus in place. Then you can put the shape over your lens, secure the rubber band, and not have to worry about your camera trying to find focus through the narrow shape. 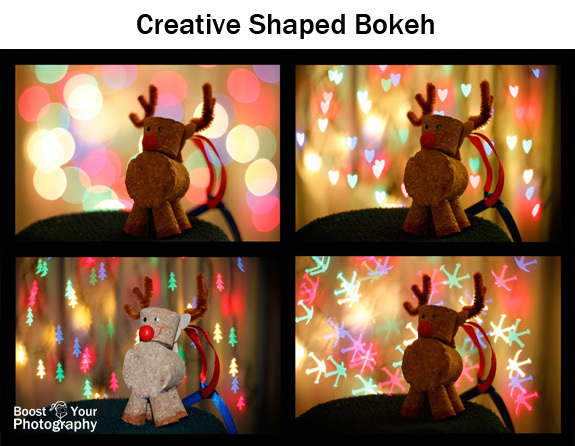 Keep in mind that your shaped bokeh will end up being much smaller than the original bokeh circles. Unless you are able to cut your shape to exactly the maximum allowable size, you will lose some of the size based on how small you have made your shape. The only compositional difference between the two photographs below is that the shaped bokeh filter was used for the second one. The distances between the subject, the camera, and the background (a lit Christmas tree) remained the same. Another difficulty with using a shaped bokeh filter is that it will further cut down on the amount of light reaching your sensor. Because you will already be shooting with your aperture wide open, you will need to use a longer shutter speed or increase the ISO to compensate. (Another reason a tripod is handy.) You may also want to consider using a flash to better illuminate your subject. The background will not need the flash, since it is already bright and made of lights. With the Chimay shots above, the shutter speed increased from 1/8th of a second for the circle bokeh to 2 seconds for the shaped bokeh. No flash was used. 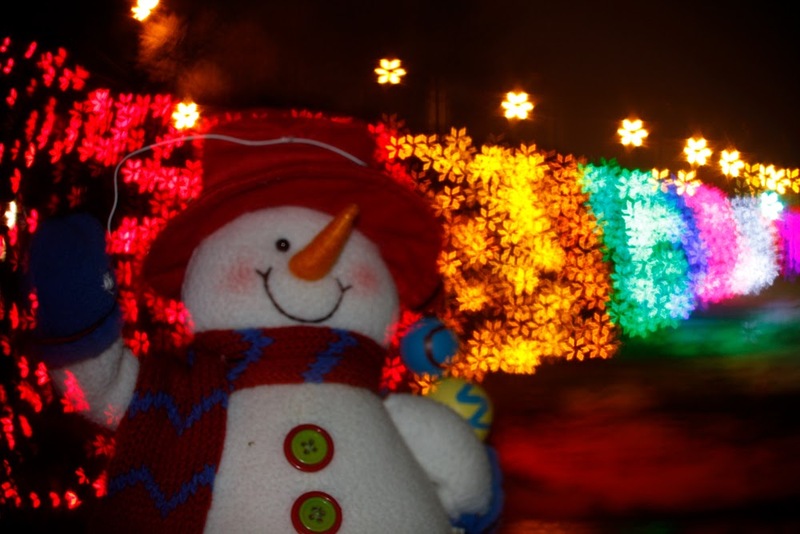 For the snowman shot, below, the camera's built-in flash was used to illuminate the snowman. The overall settings for the shot were ISO 100, f/1.8, and 6 seconds. The bits of shaped bokeh snowflakes creeping around the snowman were a result of my inability to hold him perfectly steady for the full six seconds. A steady subject (or something to hold your subject steady) can also be helpful. Experiment with different distances, both between the camera and the subject and between the subject and the background. The series of photographs below demonstrates the impact of moving closer or farther away from the background. Moving closer to the background will lead to less overlap between your shapes, but you will have less of the shapes, as less lights are in your composition. Moving farther away from the background will cause a lot more overlap of the shapes and there will be a lot more of them. 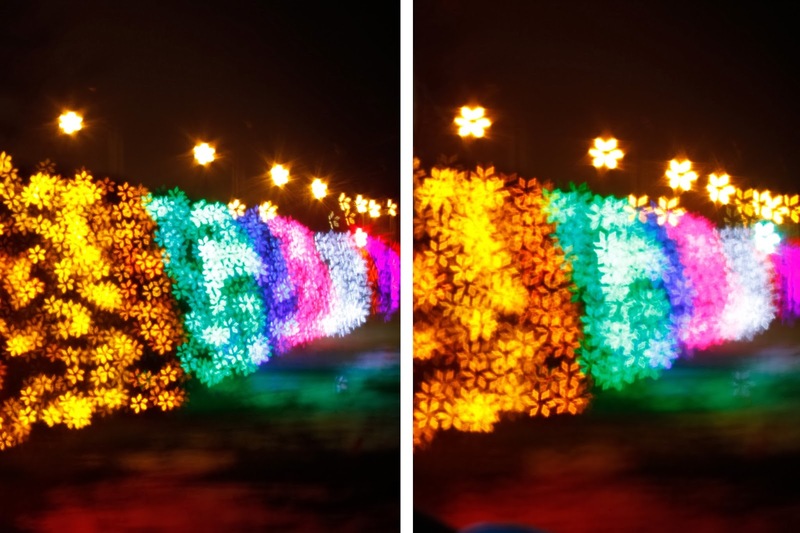 The two photographs above show the impact of moving the subject (and the plane of focus) closer to the camera. In both images, the camera and background stayed in the same place, while the plane of focus moved a foot or so closer to the camera for the second image. Moving the plane of focus that much closer to the camera also led to an increase in the size of the bokeh shapes. Shaped bokeh is a fun and easy way to make creative pictures. There are endless possibilities, and you can easily make new bokeh filters in a matter of minutes. What better way to celebrate and share the things you love? 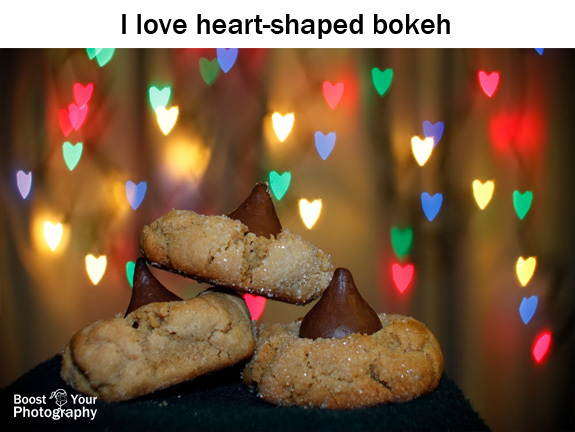 Have a favorite shaped bokeh shot you've taken? Share it in the comments below!